Dashing winger who liked plenty of space. Came from Coleraine where he was directed to the Magpies by Jack Beveridge. Played as a rover, half-forward and winger, but wing was his best place. A clever positional player who was a good mark and could break away quickly, he had fine disposal. 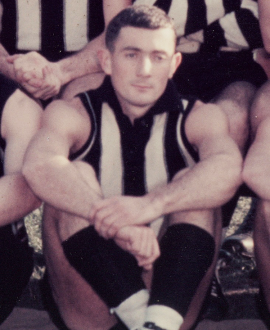 Played for Victoria in 1961 and 1962 and was a member of the 1958 flag side and the team which was beaten in the 1960 Grand Final.